Vietnam, with its gorgeous and otherworldly natural and cultural heritage sites, which film producers crave, is willing to host foreign film productions after the fresh success of “Kong: Skull Island” shot in northern Ninh Binh, Quang Ninh and central Quang Binh provinces. Director Jordan Vogt-Roberts spent six months searching the globe for places to film “Kong: Skull Island”. At first sight, his professional eyes and heart were captured by Ha Long Bay and Trang An tourism complex in the provinces of Quang Ninh and Ninh Binh, and Phong Nha-Ke Bang National Park in the central province of Quang Binh. All of his crewmembers lavished praise on the UNESCO-recognised world natural and cultural heritage sites. In a recent interview with Channel NewsAsia, Vogt-Roberts called Vietnam a raw, powerful and unspoiled beauty with a ruggedness that most audiences have not experienced on screen before. Brie Larson, starring in the film, was impressed with the untouched spectacular scenery and wondrous natural structures, saying that its beauty was why Vietnam was chosen for filming, while actor Tom Hiddleston said working in Vietnam was a privilege because people were so hospitable and he had never seen such landscapes anywhere else in the world. 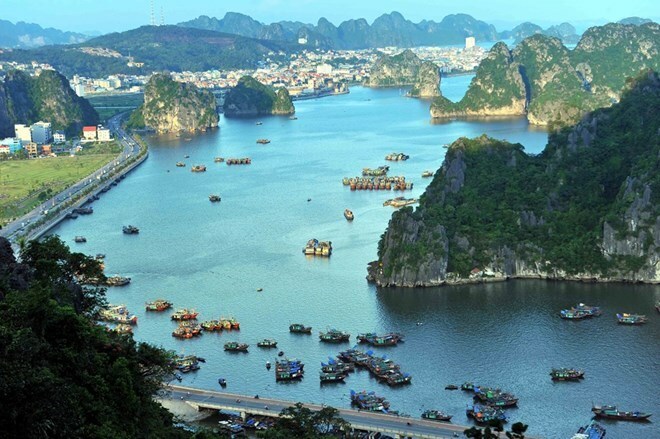 Vietnam is bestowed with an attractive nature which was the background for other successful movies. In 1992, the French film “Indochina” by Regis Wargnier shot in Vietnam won the Academy Award for Best Foreign Language Film at the 65th Academy Awards. However, the number of foreign films shot in Vietnam over the past decades can be counted on one hand. There are several reasons for this. In 2012, the project “Bourne Legacy”, starring Jerremy Renner, was moved to the Philippines instead of Vietnam, as the country was not ready to host an international blockbuster. Previously, “Bond 18”, which was initially set to be filmed in Vietnam, also had to move to Thailand for the same reason. Ngo Phuong Lan, Director of the Vietnam Cinema Department under the Ministry of Culture, Sports and Tourism, told the Vietnam News Agency’s (VNA) correspondent that all foreign film scripts must be approved by Vietnam’s competent agencies before the filming begins. However, the procedure requires coordination between several ministries, sectors and localities at different levels, and sometimes it hampered some projects. A number of localities also worried that filming could damage their natural landscapes. More recently, Joe Wright scoured the world looking for a place that perfectly fits the magical world of Neverland for the classic movie “Pan” with Hugh Jackman. He found his dreamland in the world’s biggest cave, Son Doong in Quang Binh and got approval from Vietnamese authorities. However, without promotion and marketing strategies, Vietnam’s tourism sector enjoyed few benefits from the project. One day before “Kong: Skull Island” premiered, Vogt-Roberts was appointed as Vietnam’s Ambassador of Tourism for the 2017 -2020 term. The move aims to take full advantage of his fame and the blockbuster to promote Vietnam’s tourism. Previously, then Prime Minister Nguyen Tan Dung paid a call on the crew while they were filming in Ninh Binh province, sending a clear message that Vietnam has opened the door to foreign filmmakers after decades of hesitation. In an interview with VNA’s correspondent, Deputy Director General of the Vietnam National Administration of Tourism (VNAT) Ngo Hoai Chung said the tourism sector considers this event a golden opportunity. Numerous tours related to “Kong: Skull Island” have been offered, such as “Kong’s journey” and “Kong’s homeland”, connecting Quang Binh – Ninh Binh – Quang Ninh for tourists to experience Vietnam’s nature, as it was on the big screen. The sector has also developed videos featuring Vietnam’s nature as well as spectacular scenes taken from the movie to show at overseas tourism promotion events, and send them to Vietnamese embassies around the world and other representative offices abroad, Chung said. Other products, such as Kong models, 3D photos, posters and short clips will be showcased to lure tourists to the sites while enhancing tourism service quality and strengthening protection and preservation of the natural environment, he added. Vietnam is ready to compete with neighbouring nations to be a hot spot for filmmakers, Chung affirmed. The win-win relationship between tourism and cinema is undeniable. Facts and figures have attested to this perfect marriage. “The Lord of the Rings” and “The Hobbit” by director Peter Jackson were shot in New Zealand. The country has seen a 50 percent increase in arrivals since the Lord of the Rings was released. The Hobbiton Movie Set has appealed to many tourists who visited the country. Currently, tourism is the second largest industry of New Zealand, behind dairy, tourism expert Gregg Anderson told Forbes magazine. Since “Bond 18” left Vietnam for Thailand in 1997, Thailand has hosted dozens of thousands of international productions, generating a massive fortune. According to the Thailand Film Office within the Department of Tourism, the country earned 380 million USD from hosting 4,470 foreign productions since 2010. “Kong: Skull Island” worth 185 million USD has just debuted in 65 countries worldwide, including Vietnam, kicking off a strong media and press campaign at home and abroad, with audiences and critics lauding the movie and the wondrous natural scenes of Vietnam. According to VNAT, the number of international arrivals to Vietnam reached 2.2 million in the first two months of 2017, an year-on-year increase of 33 percent. The blockbuster is expected to contribute to an increase of 30 percent after its debut. Addressing the ceremony to announce his appointment as Vietnam’s Ambassador of tourism, Vogt-Roberts praised the landscapes and the warm welcome people offered to him, and expressed his hope that the film would encourage more people and Hollywood filmmakers to visit and explore Vietnam. Director Jordan Vogt-Roberts receives the decision becoming Vietnam's tourism ambassador. Cinema can inspire viewers and send messages via sight, sound, feelings and thoughts, Ngo Phuong Lan said, adding that promoting tourism via cinema was ideal. The domestic film titled “Toi thay hoa vang tren co xanh” (Yellow flowers on the green grass) by Victor Vu has helped the south central province of Phu Yen become a tourist magnet, she said. In addition to huge economic values, the domestic cinema industry will benefit from international film productions in Vietnam, allowing local filmmakers to learn from the working style, production, marketing and promotion skills of Hollywood producers, Lan added. VNAT introduced its new tourism slogan “Vietnam – Timeless charm” to replace the old “Vietnam – Hidden charm” in 2014, with the aim of promoting new experiences available with more positive, confident and open-minded energy. One year later, the Ministry of Foreign Affairs launched high-quality seven-minute video clips “Welcome to Vietnam” in nine languages, featuring the beauty of the landscapes and people of Vietnam. The effort marked the first official media-based promotion strategy to introduce Vietnam worldwide. The capital city of Hanoi was a pioneer among 63 provinces and cities to sign a deal with the Cable News Network (CNN) to broadcast its images across the globe. Under the deal worth 2 million USD, the US channel helped Hanoi produce 30-second promotional videos, three- and five-minute reportages, as well as a 30-minute programme and promote them on its television channel and social media throughout 2017 and 2018. The two promotion videos have just been broadcast on the channel. According to Ngo Hoai Chung, only 3 million USD is earmarked from the state budget for tourism promotion and marketing each year. The amount is too modest in comparison with other nations in the region and the world. The figures are 70 million USD, 100 million USD and nearly 120 million USD in Thailand, Malaysia, and the Philippines, respectively. In 2017, the sector aims to mobilise 15 million USD for promotion and marketing activities, up 15 percent from 2016. It also hopes to earn 20.5 billion USD from serving 11.5 million foreign visitors and 70 million domestic holidaymakers, up 11.5 percent and about 12 percent, respectively. The Party’s resolution on developing tourism into a spearhead economic sector by 2020 was issued early this year. The draft Law on Tourism is scheduled to be approved during the upcoming third meeting of the 14th National Assembly. The tourism sector is hoped to grow strongly, with the cinematic sector and media offering great contributions. With the participation of localities and tourism agencies, Vietnam has a solid foundation to believe that all long-term and short-term tourism targets are achievable, Chung reiterated.